Young Lowell Beveridge comes from an extended family of politically conservative, Ivy League educated teachers who summer at their ancestral home on the coast of Maine. In 1954, fresh out of Harvard, an athlete and a historian, and now a conscripted private in the US Army, Beveridge takes a bold step: He marries an African-American woman from Harlem. It is the height of McCarthyism and he is already on the government’s radar as a suspected Communist. This book is a revelation, a personal and family saga at the very center of what became a crucial and convulsive stage in the political and cultural development of the United States. Told simply, with clarity and grace, it’s a moving story of a search for love and peace, of a family torn apart, and a country in the throes of change. After the death of his first wife, Tee, Lowell Beveridge married Caro Heller. 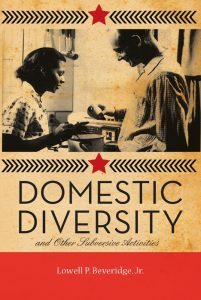 Their joint family continued the tradition of domestic diversity. He is now a widower and patriarch of an extended family of children, in-laws, and grandchildren whose members have ancestors from five continents and the Carribean.